See map below: REMINDER these trails are for XC skiing only!!! TRAIL REPORT: Despite our best efforts this week, we could not overcome what the warm weather was doing to our trails, especially the outer ones. It had been great up until Sunday, and we gave it our best shot during the week, but now we have to recognize what’s there and move on. We’ve lost the Boorman, Tom & Jerry, a lot of the Bourcy, and now the Blond. We will get our core winter trails – the Kids Loop, Father Mouchet, Saldi – in as good a shape as possible for Saturday. There will be a Buckwheat ski out to the aid station (see schedule). Aid station construction for “Alice in Winterland” has been going on all week and promises to be epic. Racers and volunteers, please ski on out on Saturday and we’ll have a burger ready for you, and some fun and games. Reminder to all: the Log Cabin Ski Trails are designated for Cross-Country Skiing Only for the safety of everyone – no snow machines on trails please! The Log Cabin Ski Trails are part of Recreation Sites & Trails BC and are maintained by our Log Cabin Ski Society volunteers from Skagway and the Yukon. The parking lot is on Parks Canada land, and outhouses in the winter are maintained by LCSS. Here is a link to the 2018-2019 Winter Weekend Schedule from Parks Canada and an article about Winter Use in the Chilkoot Trail historic sites area. The snow is almost gone in Dyea, check back next winter before Christmas for trail reports. For updated trails information, you may also call The Mountain Shop in Skagway at 907-983-2544. 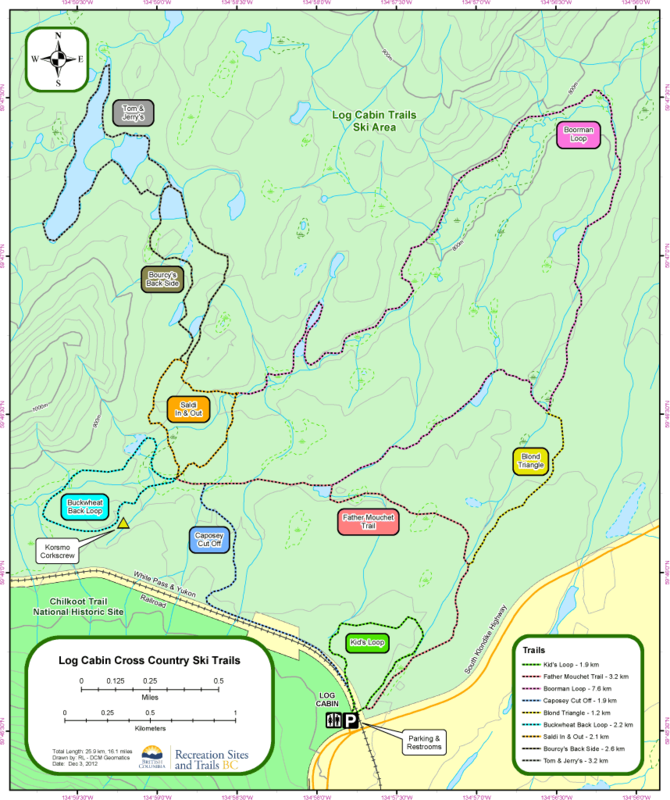 Log Cabin Ski Trails Map courtesy of BC Forestry!